You are currently browsing myenglishcountrygarden’s articles. This is a very interesting book, written by Doctor SusannaWade Martins of the University of East Anglia. Throughout her career she has studied the Holkham estate in some detail, and therefor it is highly appropriate that she has written the first biography of Thomas Coke–Coke of Norfolk-in over a hundred years. And it is of interest to anyone who has read Jane Austen’s books and has wondered what exactly did Mr knightly do? How would Elizabeth and Darcy have spent their time at Pemberley? What was Darcy’s life like before he met Elizabeth? What should Henry Crawford have been doing at this estate at Everingham? I know from my experience in the past ten years with online Austen communities that speculation about these pressing questions continues apace amongst those of us who are interested in these characters and their lives. Reading this book will , in my opinion give you one of the best impressions of the type of life they might have led, in one single, very readable, affordable volume. Now, do note, I am certainly not arguing that Coke of Norfolk was the basis for any of Jane Austen’s landowning charcters.What I am saying is that reading this book will give a good over view of the type of life these characters may have led on their estates in the English countryside,and instead of trawling though many varied books to try an understand just what that life was like , you can now purchase this one volume as a starting point and be very well served by it. Here he is, above, as depicted by Pompeo Batoni while in Rome. And then he entered politics. He was a Whig supporter all his life and was vociferously opposed to the war with America ,talking the side of the colonists. He also supported the abolition of the slave trade, the emancipation of Catholics and parliamentary reform. This book covers his personal life as well as his political life and there it is of great interest to those of us who wonder how Darcy and Elizabeth would have organised their domestic life at Pemberley. Family life for the Cokes was concentrated mainly around Holkham and the orgnaisiation of the domestic life of the house was firmly in the hands of many capable women-namely Cokes first wife and his daughter who took over the domestic reigns on her mother’s death. Doctor Martins gives a detailed account of estate life from the point of view of the women in the family and it makes for very interesting reading. I can highly recommend it for anyone interested in the lives of the upper classes of this period. A Great Estate at Work is a fascinating book, the result of Doctor Martin’s work for her Phd thesis.She was granted access to the Holkham Archive and the result is a fabulously detailed book chronicling the development of the estate from 1776-1860. Obvoiulsy this covers more than the period about which Jane Austen wrote, but it is a great help to read it in order to set in context the improvements of the agrarian revolution and how they panned out later in the 19th century. In the same vein this book,above, The English Model Farm again by Doctor Martins is rather on the specialised side , but is fascinating, showing how landlord were able to develop the ideal farming conditions, if they were sufficiently interested and motivated during the period 1700-1914. I am afriad it now appears to be out of print,but for anyone seriously interested in the development of farm bulings etc during this period I can highly reccommend it. For those of you interested in the social effects of the agrarian revolution, for example, the social distress caused by enclosing the land , then I can recommend this book by another member of staff at the University of East Anglia: Professor Tom Wilkinson. The Transformation of Rural England is a fascinating book for in great detail, it chronicles the impact of the improvements in agriculture and the changes in the usage of the land as a result. In addition it deals with the physical effect on the landscape and the social consequences of these improvements. I highly recommend it,but it is rather technical and detailed, and I would only recommend purchasing it to those of us who are serious students of the subject. But for a good and comprehensive view of the type of improvements that someone like Mr Knightley might have made and the type of life he and Darcy might have lead I can think of no better introduction than Susanna Wade Martins book on Thomas Coke. And as it is soon to be released in paperback form at a very reasonable price :got to it,say I ! I have often seen this game described in notes to editions of Pride and Prejudice as a game of tomboloa, and this is incorrect, the confusion probably arising by the reference in that passage to lottery tickets. Some notes also think it is a reference to the National lottery, not that now run in 21st Britain, but one that began in the early 18th century as an attempt by the government to regulate the taste for lotteries as a form of mass gambling. This was a craze that had by the end of the 17th century become a source of disrepute, lotteries being run for the benefit of corporations and private individuals without much regulation. By 1699 it was felt necessary to introduce a General Prohibition. Despite this, private lotteries were still run in the early 18th century. Government intervention therefore had to take a different tack and in 1709 the government attempted to regularise them by taking over the running of the lotteries. It passed an act to allow this state control take place. Throughout the majority of the 18th century lotteries were, therefore, in the main under state-control, and in fact, by 1776 state- run lotteries had become annual events. They were especially popular during the reign of George III. The records show that from 1769-1826 some 126 state lotteries were held- 110 while George III was King and 16 during the reign of George IV. In truth, the foundation of the lottery is so radically vicious, that your Committee feel convinced that, under no system of regulation which can be devised, will it be possible for Parliament to adopt it as an efficient source of revenues, and at the same time divest it of all the evils and calamities it has hitherto proved so baneful a source. Eventually in 1823 the government enacted provisions for the discontinuance of the lottery which were to come into effect in 1826. But that is not the game Lydia Bennet was playing at Mrs Phillips’s house in Chapter 16 of Pride and Prejudice. The cards being shuffled and cut by the left hand person, one dealer gives every person a card, face down, for the prize, on which is to be placed different values of counters from the pool,at the option of the person to whom each card has been given. The second dealer then delivers to each player from the other pack, a card for the ticket. Next the cards are turned, by order of the manager, and whoever happens to have a corresponding card takes the prize upon the card dealt to him and those remaining undrawn, are returned to the hand…..
Just the sort of game to engross Lydia, a girl not known for her towering intellect. Elizabeth went away with her head full of him. She could think of nothing but of Mr. Wickham, and of what he had told her, all the way home; but there was not time for her even to mention his name as they went, for neither Lydia nor Mr. Collins were once silent. Lydia talked incessantly of lottery tickets, of the fish she had lost and the fish she had won; Mr. Collins, in describing the civility of Mr. and Mrs. Philips, protesting that he did not in the least regard his losses at whist, enumerating all the dishes at supper, and repeatedly fearing that he crouded his cousins, had more to say than he could well manage before the carriage stopped at Longbourn House. Fish counters were commonly used in 18th and early 19th century gaming tables and could be made from a variety of materials. And some made of mother of pearl. Of course, not all early 19th century gaming counter were fish shaped. Some were very beautifully engraved with values and intricate designs on the reverse. And if you were well to do, you would have had a set of counters engraved with your coat of arms or cypher, as here in this one, again from my collection, engraved with the initials, J.A. I don’t for one moment think that Jane Austen was wealthy enough to have her own counters engraved in this way, but I’m glad it is in my collection nevertheless. Parlour games were played throughout Christmas and during the 12th Night celebrations in Jane Austen’s era. What was snap- dragon? It was another parlour game, but one specifically played in winter in the dark, for it involved picking raisins and almonds out of a punch bowl of flaming spirits, usually brandy. The blue flame of the lit brandy would have looked spectacular in a darkened room, very similar to effect producted by the tradition of flaming the Christmas Pudding with brandy. Though brandy does not burn at a particularly high heat it was still possible to be scorched and the point of the fun was to watch peoples expressions as they darted their fingers through the flames, picking out the fruit or nuts. Jolly. Yesterday we considered some of the domestic duties of the housekeepers of Jane Austen’s era. Housekeepers in grand houses had another more public role for they tended to be the person who would conduct guided tours of the house to paying visitors. Let’s consider this process and a rather famous housekeeper…. We know from our reading of Pride and Prejudice that the procedure for getting admitted as a visitor to an important house in the English countryside of the early 19th century was quite simple, provided one had the means of transportation and the correct attire : you applied to the housekeeper for a tour of the house, and if you were lucky, the gardener might also show your party around the gardens. Tourism in the UK,- visiting grand country houses for example- developed apace in the 18th century. Why? First, because of the developments in travel .If you couldn’t “get” to a country house easily you couldn’t visit it. Improved roads and the system of posting horse and carriages for hire, made travel easier for those who could afford it. Secondly ,The Grand Tour of Europe , as undertaken by Edward Knight, Jane Austens’s brother, was tourism on a grand expensive and foreign scale, but the wars with Napoleon curtailed foreign travel to a large extent, so people turned to touring England and Wales for their leisure and education. The rise in the cult of “taste”, as advocated by Edmund Burke, especially with regard to his “Philosophical enquiry into the Origins of our Ideas of the Sublime and the Beautiful “(1757) and the “Picturesque” as developed by William Gilpin and his books, meant that people at last began to explore their own country, equipped with sophisticated guides for the evaluation of art, architecture and natural scenery. The late 18th century/early 19th century tourist saw the visiting of country houses, not only as a pleasant activity, but one which gave them an opportunity to develop and exhibit ones “taste”. Many houses were open to the public. Horace Walpole, the famous antiquarian, regularly opened his house, Strawberry Hill, near Twickenham. It was a roaring success. Much of the ephemera of that period associated with the openings have luckily been preserved and give us some idea of the process for the owner and the visitor. “I am tormented all day and every day by people that come to see my house, and have no enjoyment of it in summer. It would be even in vain to say that the plague was here. I remember such a report in London when I was a child ,and my uncle Lord Townshend,then secretary of state,was forced to send guards to keep off the crowd from the house in which the plague was said to be-they would go and see the plague. Had I been master of the house, I should have said….”You see the plague! You are the plague”. Poor old Horace was so inundated with visitors to his extraordinary house, that after he had been disturbed at dinner by the arrival of three Germans Barons who wished to visit his house, he eventually would only allow his housekeeper to admit people to his house if they could show her a signed ticket obtained from him in advance. “…..Mr Walople is very ready to oblige any curious persons with the sight of his house and his collection….it is but reasonable that such persons as send, should comply with the rules he has been obliged to lay down for showing it. No ticket will serve but on the day for which it is given. If more than four persons come with a ticket, the housekeeper has positive order to admit none of them…..
Every ticket will admit the company only between the hours of twelve and three before dinner,and only one company will be admitted on the same day. As I have said other grand houses opened their doors to the respectable paying public: Holkham on the Norfolk coast, the home of Thomas Coke and subsequently the Earls of Leicester was open to tourists while it was being constructed and afterwards. Visitors flocked to it in quite surprising numbers bearing in mind its somewhat isolated position on the North Norfolk coast. Lord Bath and his Countess and his son have been making a tour at Lord Leicester’s; they forgot to give anything to the servants that showed the house: upon recollection- and deliberation , they sent back a man and horse six miles with- half a crown! What loads of money they are saving for the French! indicating that at some houses a sort of class distinction regarding admittance was made. ” congregate in the Vestibule under the Portico and the Saloon, to wait for the Person who shews the House”. Interestingly, the Guide describes a route around the rooms which is still the route taken by tourists today. Chatsworth House in Derbyshire, the home of the Dukes of Devonshire was the first house to adopt the habit of reserving “open days” for tourists and as early as 1760 it was open though only on two public days each week. Derbyshire was a very popular destination. Guides like the Reverend William Gilpin’s book, Observations on Several Parts of England, particularly the Mountains and Lakes of Cumberland and Westmoreland Relative Chiefly to Picturesque Beauty made in the Year 1772, provided potential visitors with a route and expectations of what they could see in these somewhat remote areas. Indeed, the route taken by Elizabeth Bennet and the Gardiners through Oxford, Blenheim Palace, Kenilworth ,Warwick etc was the one recommended by Gilpin in that book . 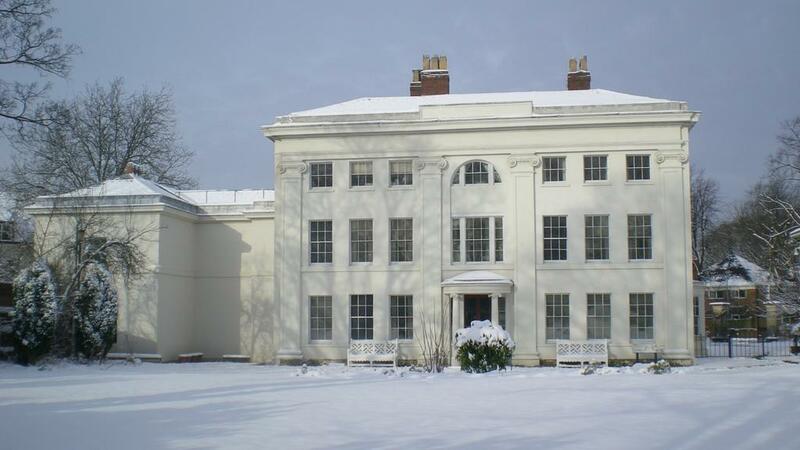 Mrs Lybbe Powys also took that route on her trip to Jane Austen’s most northerly destination,Hamstall Ridware in Staffordshire. This book seems to have influenced Jane Austen tremendously, with its descriptions of Dovedale, the Peak, Matlock, spas at Buxton and houses such as Chatsworth, Haddon Hall and Kedelston. The picture above is of Mrs Garnett who was the housekeeper at Kedelston Hall in the late 18th/early 19th century. Kedleston was the Adam designed home of the Curzon/Scarsdale family, in Derbyshire. She was famous for her excellent guided tour. In her hand, as shown in the portrait, you can see a copy of the Catalogue of Pictures, Statues, &c. at Kedleston, which was ready to be put into the hand of the next enquiring visitor. Such guidebooks had been produced at Kedleston since 1769, with subsequent editions revised to take account of the ever-expanding art collection. It was an important means of recording the identities of the sitters in portraits, which were of greater interest to 18th-century visitors than matters of attribution or iconography!! A consequence of not having such aids was recorded by Horace Walpole, who described how at Petworth the 6th Duke of Somerset refused to let his servants have new picture lists, so that when he died, half the portraits were unknown by the family! Although it was by no means uncommon for house servants to act as guides, it was unusual for the housekeeper herself to be painted. That she was immortalised in this way perhaps indicates the respect and affection in which this long-serving and highly capable servant was held; indeed, she was given a gravestone describing her as ‘sincerely regretted’. I am of the opinion that this famous and beloved servant was the model for the depiction of Mrs Reynolds in the BBC’s 1995 adaptation of Pride and Prejudice. And I often wonder if on her travels, or of those of her kinspeople, she heard about this paragon and if her reputation influenced Jane Austen a little when she gave us the full and wonderful pen portrait of a sensible devoted housekeeper in her most famous novel. This is the first in a series of posts about Jane Austen and Servants, looking at the roles of servants in her novels and in turn what their roles entailed in a Georgian household. Wright herself is shown to be full of professional rivalry unchecked by her appalling employers, and holds Mrs Hodges reputation as “cheap” . On that fateful visit to Southerton Court in Mansfield Park we meet Mr Rushworth’s housekeeper who finds a soul mate in Mrs Norris(*shudder*). Of course the housekeeper we know best is the wonderfully voluble but correct Mrs Reynolds in Pride and Prejudice, the venerable servant at Pemberley House full of affection for her employer and discreet scorn for the dastardly Wickham. What exactly did the role of housekeeper entail? Her role in a household was described with minute exactness in Samuel and Sarah Adams’s book, The Compelte Servant (1825). As might be imagined the Housekeeper was the most senior female servant. … she is the locum tenens, the Lady Bountiful, and the active representative of the mistress of the family; and is expected to do, or to see done, everything that appertains to the good and orderly management of the household. The situation of a housekeeper, in almost every family, is of great importance.-She superintends nearly the whole of the domestic establishment,-has generally the control and direction of the servants, particularly of the female servants-has the care of the household furniture and linen-of all the grocery-dried and other fruits, spices, condiments, soap, candles, and stores of all kinds, for culinary and other domestic uses. The Housekeeper now (after dinner has been served-JFW)begins to find herself at leisure; by this time too, the maids will have done the principal part of their work above stairs, and the cook, kitchen maid , and scullion, have washed up, and cleared away every thing, and cleaned up the kitchen.-After tea, the provident housekeeper will begin to think about tomorrow; evening being the best time for preparing all things that are likely to be wanted soon.-Small quantities of spices should be pounded and ground, and laid by in bottles, well corked, ready for use.-Much less spices are necessary, in gravies, &c. when thus prepared, than when boiled whole.-Raisins may be stoned, if wanted next day.-Currants may be washed, picked, and perfectly dried. White sugars should be broken, or pounded, rolled with a bottle, and sifted. Some of the oranges and lemons, to be used for juice, should be pared, and the rind put by to dry; and of some, when squeezed, and the pulp scraped out, the rinds may be kept dry for grating. In families where there is a house-steward, the marketing will be done, and the tradesmen’s bills will be collected, examined, and discharged, by him; but in many families the business of marketing and of keeping the accounts devolves on the housekeeper. It is therefore incumbent on her to be well informed of the prices and qualities of all articles of household consumption in general use; and the seasons for procuring them, in order that by comparing prices and qualities, she may be able to substitute those that are most reasonable, but equally to her purpose, and best attainable, for others that are most costly or more scarce. In the situation she will have to carve, and as she will occasionally be required to assist the cook in dissecting a dish to be sent up stairs, it is indispensably necessary that she be proficient in the art of carving: and besides, to carve meat well, is a great saving. It would argue prudence and economy in her, to see that the pieces of bread which are brought down stairs, be eaten at this table, or in the servants’-hall, and it would be extravagance to suffer new bread to be eaten below stairs. She ought to be a steady middle-aged woman, of great experience in her profession, and a tolerable knowledge of the world. In her conduct, she should be moral, exemplary, and assiduous, as the harmony, comfort, and economy of the family will greatly depend on her example; and she must know, that no occurrence can be too trifling for her attention, that may lead to these results, and whereby waste and unnecessary expense may be avoided. When the entire management of the servants is deputed to her, her situation becomes the more arduous and important. If servants have hardships to undergo, she will let them see, that she feels for the necessity of urging them. To cherish the desire of pleasing in them, she will convince them, that they may succeed in their endeavours to please her. Human nature is the same in all stations. Convince the servants that you have a considerate regard for their comforts, and they will be found to be grateful, and to reward your attention by their own assiduity: besides, nothing is so endearing as being courteous to our inferiors. Female servants who would pursue an honest course, have numberless difficulties to contend with, and should, therefore, be treated kindly. The housekeeper in a great family, has ample means of doing good; and she will, doubtless, recollect that it is a part of her duty to protect and encourage virtue, as the best preventive from vice. Trust-worthyness is an essential quality in a housekeeper; but if she be not as vigilant as she is honest she cannot discern her duty well. As she is the deputy of her mistress, she should endeavour to regard everything around her with the keenness an interest of a principal, rather than the indifference of a servant.. Even if you should be perfectly satisfied that your housekeeper is a woman of great integrity you will still find it desirable to fix your eye continually upon her that her vigilance and integrity may not relax for want of this incitment. Symptoms of neglect on her art should never be over looked as they would tend to throw the whole house into confusion and irregular habits. Mrs B: Have you provided yourself with a cookery book? Mrs L : Certainly .I have purchased Mrs Rundells and the Cooks Orabcle.How could I go on for one day without them? Yet my study of these important books is not always satisfactory, not are the effects produced from them at all equal to my expectations.. The housekeeper washes and irons her own small things and her Mistresses .A board at Vinters has been put up for her in the mangling room that the heat might be avoided in summer. The housekeeper mends her master’s silk stockings , ruffles his shirts and new collars and risbands them. All the linen looked over in the Store room Monday morning and stains taken out etc. Housekeeper to put any stitches in Mr Whatman’s muslin neckcloths that Mrs W has not mended for him…The first thing a Housekeeper should teach a new servant is to carry her candle upright. The next thing is those general directions that belong to “her’ place in particular such as not setting the brooms and brushes where they will make a mark and all those common directions. The Salary of the Housekeeper is from twenty-five to fifty guineas per annum, dependent on the extent of the family, and the nature of the business she undertakes. Note that a House Steward would expect to receive remuneration of between £100 -£250 per annum and perhaps more. A butler could expect to earn £50 to £80 per annum in large households. Hmmm…….. But of course a housekeeper could expect to receive an addition to her income in grand households, in the form of gratuities earned by showing guests round the house as Mrs Reynolds does in Pride and Prejudice. And we shall look at that aspect of a housekeeper’s role in our next post on the role of the housekeeper in Jane Austen’s era.